Requiem for a Dream of Mozambique? Maputo, Mozambique Nov. 23, 2000: Citizens pay homage to slain journalist Carlos Cardoso at the place of his death, one day after the fact (Photo: Armando Munguambe). When someone dies, we grieve more than the simple loss of a person we knew. We grieve for ourselves, for the family, for those whose lives he touched, for those he would have touched. In the case of Carlos Cardoso—crusading editor, dogged investigative journalist, family man, friend, and patriot in the best sense of the word—my grief is for a nation: The still-young but no longer so hopeful nation of Mozambique, one of the poorest in the world, and yet one to which Carlos devoted all of his world-class talent, energy, and charm. Carlos Cardoso has been dead for two years. He was assassinated in the street in Maputo, Mozambique’s capital, in November 2000. This December, with the trial of his accused killers, Carlos’s death, and his life, have come back into sharp focus for me—as for many others who admired and respected him. Like many other reporters working in Southern Africa in the 1980s, I knew Carlos and liked him a great deal. As editor of the official Mozambique news agency, AIM, Carlos was an indispensable local contact for outside journalists seeking to understand the country—socialist in orientation, hosting experts, technicians, soldiers, and spies from the Soviet Union and East Germany, but markedly independent and assertive of its own identity. But Carlos was more than just another of the contacts that traveling journalists must make in countries they visit from time to time. Carlos Cardoso was a phenomenon. One of the very few white people to remain in Mozambique after it gained independence from Portugal in 1975—the Portuguese government essentially collapsed and ran from its overseas colonies—Carlos was a member and a faithful supporter of the ruling Mozambique Liberation Front, known as Frelimo. He was that rarity, an ideological man with a sense of humor, balance, and an enjoyment of the non-ideological aspects of life. Bearded, short of stature, solid, smiling, humorous, Carlos was a charismatic, persuasive spokesman for the cause he espoused. To my knowledge, he never stopped believing in the multiracial, socialist, grass-roots democratic principles that made newly independent Mozambique a magnet in the 1970s for idealistic young Westerners and aid agencies wanting this experiment to succeed. Arguably, the experiment has foundered. It is hard for me to say this, and Carlos might well have disagreed, but such is my belief. There are many reasons for the shipwreck of egalitarian Mozambique. One was certainly the nonstop middle-intensity war waged on the country by South African-supported guerrillas of Renamo, the self-described National Resistance Movement, starting very shortly after independence and into the 1990s. The war sapped the country’s strength, preventing Frelimo from implementing much of its socialist development plan at the time when its ideological strength and fervor was highest, and its external support the greatest. Another reason was the untimely death in a plane crash of founding President Samora Machel, a charismatic man who united the country in a way his successor, Joaquim Chissano, has been unable to do. Perhaps the final blow to Mozambique Carlos dreamt of at the moment of the country’s independence was dealt by the corruption that, inevitably it seemed, invaded the weakened country along with foreign money once the war was finally over. It is this corruption that Carlos Cardoso, in what turned out to be his final years, fought to bring to light—a battle in which he eventually became a casualty. He founded the independent faxed daily newspaper Metical (the metical is the Mozambican unit of currency) and probed deeply into the economy’s creeping rot: Foreign interests buying complaisant local partners to help them make money in decidedly non-socialist, non-egalitarian ways, and in the process crippling legitimate local industry. Metical didn’t hesitate to turn its searchlight on high places, looking into the business dealings even of members of President Chissano’s family. The last and broadest scandal tackled by Carlos was the huge bank fraud that accompanied the privatization of Mozambique’s largest bank, the Banco Commercial, in 1996. Initial reports said US$14 million was siphoned off, allegedly by members of the well-connected Abdul Satar and Ramaya families. Testimony at the murder trial has put the figure at between US$150 and US$300 million, and alleged that the real beneficiaries were senior bankers with close links to Frelimo. Contrast fraud of that scale, if you will, with Mozambique’s Gross Domestic Product of about US$4.2 billion a year. Metical’s reporting on the fraud resulted in the dismissal of attorney general Antonio Namburete and most of his staff, and shook the country’s ruling circles. It was for this, according to police investigations of the murder, that Carlos incurred the enmity of members of Mozambique’s elite. 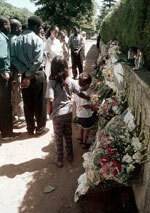 On Nov. 22, 2000, Carlos Cardoso was gunned down in the street, along with his driver, as he left the Metical office. The killers escaped in a car. Carlos was only 48. After nearly two years of investigation and preparation, the trial of six men for his murder began in late November at Maputo’s city prison. Three of them are accused as the hit men, while three—two of the Abdul Satars and Vicente Ramaya—are said to have contracted the killing. The alleged leader of the hit squad “escaped” from prison—some degree of official complicity in his flight seems almost certain—and is being tried in absentia. One of the main themes of the trial has been the role, if any, played by Nyimpine Chissano, a son of the president and a prominent businessman, in Carlos’s death. Conflicting testimony has been offered by various witnesses as to whether checks written by the younger Chissano were linked with a payment to the murder gang, or were simply security for a business-related loan from one of the accused, a notorious loan shark. The trial, inevitably, has been politicized, with a faction of Frelimo opposed to President Chissano apparently trying to use Carlos’s death and memory for its own ends. Carlos’s undisputed role as the conscience of Frelimo is a mantle that ambitious politicians wouldn’t mind casting over their own shoulders. In this political climate, President Chissano is pretty much obliged to let the trial proceed, which he is doing. At the same time, it’s clear that shadowy interests are not happy with the revelations that are coming out at the trial: The home of the prosecuting attorney has been burglarized, the judge’s car has been tailed by people with as-yet unknown motives, and a key witness has reportedly received threatening phone calls. Much of this, by the way, is being reported to the outside world by faithful old friends and colleagues of Carlos—Paul Fauvet at AIM, and Joe Hanlon, a former foreign correspondent in Maputo, now a senior researcher at the Open University in Britain, who runs an informal Mozambique information service by e-mail. I think Carlos would have been happy to know that so much of the seamy underbelly of Mozambique’s economy is being exposed as a result of his death. He really believed Mozambique’s political motto—“A luta continua; the struggle continues”—and Carlos’s struggle does continue as a result of the prosecution of his killers. I think, too, that the irony of the thing would not have escaped him: The trial with its many revelations actually constitutes the ultimate investigative reportage of his career, and he’s not around for it. Irony or no, I still grieve. For Carlos, for his widow, for his two children. For Paul and Joe, and for Carlos’s other friends scattered throughout the world. For the staff of his newspaper, which closed a year after his death. For the loss in its prime of a successful life, a life well lived. I grieve for myself, too, because Carlos Cardoso’s death in some way closes a chapter of my life that was full of interest, idealism, and enthusiasm. Most of all, I grieve for the dream of a different kind of Mozambique—his dream—and I wonder whether any number of revelations or exposés can be enough to bring it back. Dave Clemens was deputy bureau chief in the Harare, Zimbabwe, bureau of Agence France-Presse, the French news agency, from 1981 to 1984. He covered events in Zimbabwe, Mozambique, Zambia, and Malawi. He is now a contributing editor at World Press Review, a poet, and a freelance journalist.